Leg pain during pregnancy casefile discusses a typical patient. Leg pain during pregnancy casefile discusses a typical patient at the clinic; it's particularly problematic for the older woman who has other children to care for, a house to clean, and perhaps even hold down a job. Leg pain during pregnancy is clearly a common affliction as measured by my own clinic and the amount of mail I get at contact. There are indeed many causes of upper leg pain so a careful clinical examination is always indicated. Mrs P, 38 years old woman, was not enjoying her fifth pregnancy. The first four were routine, but now she has had severe upper thigh and groin pain, and some buttock ache for the last six weeks. The pain was particularly bad at night, and she couldn't sleep. There was no obvious cause except that she is high pregnant, or hoog zwanger as we say in the Netherlands. She's in her 35th week. The first and most noteworthy observation was that Mrs P was clearly exhausted. She had a haggard look about her that I didn't like. What's more she was very apprehensive, never having consulted a chiropractor before, but she was desperate. Having tried all else, I was her last port of call. Leg pain during pregnancy casefile is an interesting yet slightly embarrassing consideration from the chiropractic coalface. Having gone through the usual clinical history, where does it hurt, when did it start, what makes the pain worse, what previous treatment had she had ... we proceeded to the examination. Pain on forward bending in the right buttock. A marked right sacroiliac joint fixation. 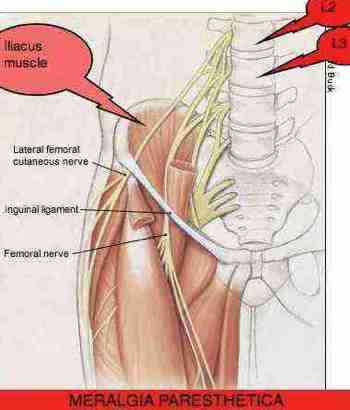 Extreme pain in the Adductor magnus muscle in the inner thigh. Exquisite tenderness where the Superficial Femoral Cutaneous nerve exits from the groin under the inguinal ligament. No sensory, reflex or muscle weakness abnormalities. Full and normal range of motion of the hip, albeit with discomfort in the groin. A positive femoral nerve stretch test. I always ask that the spouse accompany the patient in this instance. Firstly to reassure them both about the condition and the proposed treatment, secondly because the treatment is painful and thirdly because it is in an intimate area: the inner thigh, the pubic bones and the groin. It's good to take your spouse along. The activator technique lends itself well to the pregnant patient. So I used this little instrument to adjust her sacroiliac joint and L1. The treatment of the groin is awkward and painful for all concerned. I don't like inflicting pain, and chiropractic treatment isn't usually painful, and she didn't like receiving it. I gave her the Maigne's syndrome exercises to try; very gently, and recommended massaging bed rest several times each day. It was gratifying this morning to see a very different patient. She looked rested and at ease. Mrs P reported that she had slept normally for the first time in weeks for the last two nights. All this after only two treatments. There was not much improvement in the sacroiliac joint pain, so we attempted a gentle general chiropractic adjustment, and a drop toggle on her hip bone whilst lying supine. Whilst we have a ways to go yet, as she says if it simply remains this much better for the next four weeks she will be more than delighted. 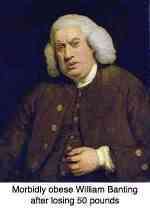 Meralgia paresthetica is what we call a double-crush syndrome. There is always an upper lumbar subluxation, from where both the Femoral nerve and the Lateral Femoral Cutaneous nerve originate, and an entrapment in the groin. Notice where the Lateral Femoral Cutaneous nerve emerges in the picture above from under the Inguinal ligament. That's exactly where Mrs P was exquisitely painful. It's a condition often related to pregnancy (and obesity, and tight clothing) but certainly not exclusively. Double crush: Lumbar facet syndrome at L1-2-3 area + impingement under the inguinal ligament. The condition responds very gratifyingly to both doctor and patient if the correct careful, and I'm sorry to say, not too gentle treatment is applied. I make only three swoops through the area and it hurts. A lot. You may have some bruising. She didn't fortunately, but it does happen. Maignes syndrome and Meralgia Paresthetica have an important common feature - they both originate from the upper lumbar spine. However, Maigne's affects the nerves that emerge and go posteriorally, whilst MP affects the anterior nerves, in particular the Femoral nerve and its little branches like the Lateral Femoral Cutaneous nerve. Both need to be considered in every leg pain during pregnancy casefile. 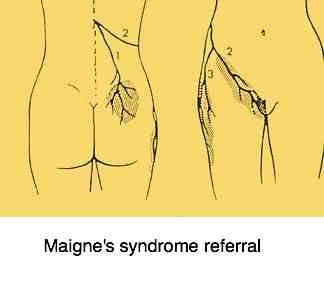 Maigne's has a negative Femoral nerve stretch, but both can have a concomitant sacroiliac joint fixation, buttock pain and upper leg and groin pain. Distinguishing between them isn't always easy, though in theory it should be. I call them first cousins. Maignes syndrome exercises are pertinent to both conditions. The treatment of both conditions has many common features. Purely 'medical' conditions too, like swollen lymph nodes, inguinal hernias, hip arthritis (rare, but does occur in this age group, especially after a poorly managed Perthe's disease or Slipped Capital Femoral Epiphysis). Your Chiropractor will examine you carefully to make a correct diagnosis and apply the appropriate treatment. X-rays obviously are discouraged during pregnancy except in very exceptional circumstances which makes his/her work more difficult. Keeping fit during pregnancy is not easy; weight gain, fatigue and the extra demands of doctor's visits and prenatal classes make it difficult. Because pregnancy and lower back pain are almost synonymous I recommend that all pregnant women do some simple lower back exercises; they take only two minutes before getting out of bed in the morning, and the trick is to start them before backpain begins. At this page you'll find lumbar facet exercises, disc exercises, sacroiliac exercises, core strengthening exercises. If you have no pain, or only mild discomfort then all are suitable. Just remember, you're not preparing for the Olympic squad. Take them slowly, get to know your own body, because there is no set of exercises that are suitable for every back. If in doubt, get advice from your chiropractor. Mind you, that big day is not unlike your own personal Olympics. Get into training. This little test will give you an idea of your overall level of fitness. This is not intended to be an exhaustive page on the subject. It deserves a full page, even a whole site. Foods with High folate levels are vital for us all because of its necessity to break down toxic homocysteine, but it's especially true in pregnancy when DNA is being rapidly synthesised. Also known as Folic Acid (B9) it is vital in preventing anaemia too. Folate is also vital in the early weeks of pregnancy when the neural tube is forming. Spina bifida is not to be messed with. Prevention with foods rich in folate. Two vital fats are omega-3 and oleic acid making up a large proportion of the brain and the covering the nerves and growing foetus. General low back exercises from CHIROPRACTIC TIPS are suitable during pregnancy too. Return from Leg pain during pregnancy CaseFile to sacroiliac joint.